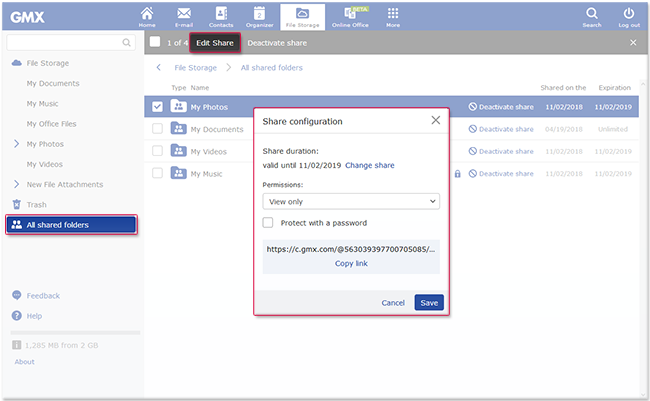 Share your files within your GMX File Storage so your friends, family and acquaintances can view or download these files. You can share files and folders in your File Storage so your friends and acquaintances can view and download these files. You can protect these shared folders with a password to protect the contents. It is easy to gain an overview of your shared folders. Under All shared folders in the menu on the left, you can view all the shared folders with the share type, share date and expiration date. You can find more detailed information about a shared folder if you click Edit share in the Actions menu after you have selected a folder. In this overview, you can view and edit the share details.